Like clockwork, IHS iSuppli mercilessly tears down new iPhone (s aapl) models and exposes their inner works, looking to divine the secret of their manufacturing and components costs. On Thursday, the firm released its analysis of the latest and greatest, the iPhone 4S. IHS iSuppli notes that these costs don’t include software, licensing or other expenditures associated with creating and designing a phone. The teardown also revealed some interesting new components contained in the iPhone 4S, not in its predecessor. These include the redesigned cellular network antenna that IHS calles “unique” in its ability to support all carrier partner network technologies, when compared to the approach taken by most of Apple’s competitors. Another new supplier discovered during the teardown is Hynix, which provides the NAND flash memory for the specific unit disassembled by IHS. Toshiba is another known source for the iPhone’s flash storage, but if Hynix is a new supplier as IHS believes, that’s a major boon for the company, since flash is either the most expensive or second-most expensive component in the iPhone, depending on which model you’re looking at. It looks like Apple hasn’t sacrificed its margins in order to deliver a more advanced device with the iPhone 4S. What are your thoughts on the latest iSuppli breakdown? The concept is almost everything is value based priced and not cost based. CBP is not efficient and it does not let companies convey the true value of the item. There are about a million books about this. And it is not surprising! Plus, Apple makes things in bulk – they achieve economies of scale and hence can reduce cost. 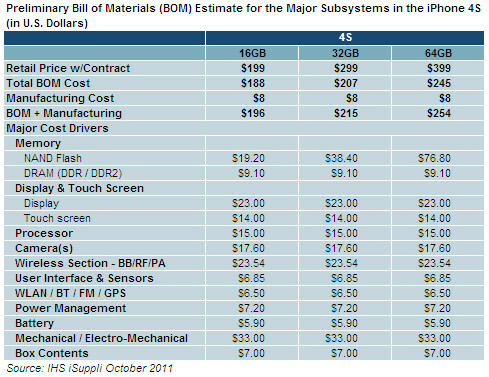 If you wanted to build just one single iPhone 4S then it will cost you quite a lot – I would say around 600 or so (statistically). This is nothing – it cost Amazon 85.15 to make a Kindle when they were selling it for 259! I consulted for Amazon and we suggested a drop in price along with other strategies that I cannot disclose and now you see the new picture of Kindle! The above exploited statement shows the rivals are interested to make the image down of APPLE. HAHAH LOL! There are some brains put to make this device robust..where is the cost invloved for makeing iOS 5…all developer pain goes in vein? licensing costs, import and export costs, etc. can drive their actual costs to easily another $3-500.